Interesting place, Orlando. The weather patterns seem very repeatable every day. It starts with a warm morning and heats up through the day until the humidity and heat combination becomes uncomfortable at which point nature steps in and thunderstorms visit the land. Later the rain stops and the cycle begins again. It’s why it’s a very green place . It is worth however issuing a warning to Brits considering coming here on holiday. Summertime in the UK, that time of year when you all want to take off somewhere, is low season in Florida. As I write the pool has emptied and lightning lights up the land. Although you have been seeing blog posts showing what a good time I’ve been having in Orlando I am actually here for business. Tomorrow I’m participating in a panel on Unified Communications. In the UK some people have been trying very hard to move the buzzword on. It’s tired they say. We need something new and fresh. Well nobody has come up with a new and fresh alternative so here in Orlando, Genband are sticking with UC. The term UC might stick but what it looks like “under the hood” is changing. The basic tenets, presence and Instant Messaging for example, are still there but how you can execute a service is changing out of all recognition. By and large we might consider most VoIP offerings to date as being simply PSTN replacements. There are some exceptions. At Timico we provided a PC client that could be integrated with a desktop phone to provide directory services together with the ability to send an IM and see other people’s presence. We did this from T0. Our T0 was probably years ahead of the market. Now everyone who uses social media intuitively uses the type of UC services we offered. I talk to my daughter Hannah in her University bedroom using Google Hangouts or via Facebook IM. People use Skype out for lower cost overseas phone calls. I’m sure there are many other similar services – I’ve stopped counting or looking. What most of the big social network based UC services lack is a means of connecting to the PSTN. Skype is the exception to this but really people don’t use Skype as a platform in the same social way that they use Facebook, say. In the early days of the Timico UC service offering we were approached by a London based business with a substantial online user community. They wanted us to embed Skype type services into their website to add value. However they didn’t want to pay for it, or not much at least, and in any case the development effort would have been too great and the project was abandoned. At the time there were also practical considerations such as whether the service would work in an ubiquitous manner without requiring specific in premise engineering support to configure firewalls, for example, a problem seen by many SIP service providers. Almost ten years and many thousands of VoIP installations later the world is about to move on to WebRTC. WebRTC promises to fix the implementation issues of SIP and easily facilitate the website integration sought by that early Timico customer. Genband, our hosts at the Perspectives14 conference have I know been selling a WebRTC capability for a year or so. My thoughts on the subject were originally so what? WebRTC type features, largely what you already get with platforms such as Skype, Google Hangouts and Facebook, will be free. There are open source WebRTC tools out there. A web developer pal of mine used WebRTC on on a website he built for a client that wanted his staff to sign in for work by standing in front of a webcam and taking a mugshot. The missing piece however is the connection to the PSTN. It’s fine being able to chat to my daughter using Google Hangouts but that doesn’t allow me to hook up with my mother who might have heard of Google but that’ about it. Genband, and this is not an advert for them, are a company naturally poised to provide this intermediary service. They already make media gateways, session border controllers and media servers and the provision of a service that allows a WebRTC interface on your website to connect to the PSTN is simple for them to do. What WebRTC also brings out of the box is speed of implementation. It’s a simple case of calling up pre-designed features (IM, video, screen sharing etc). 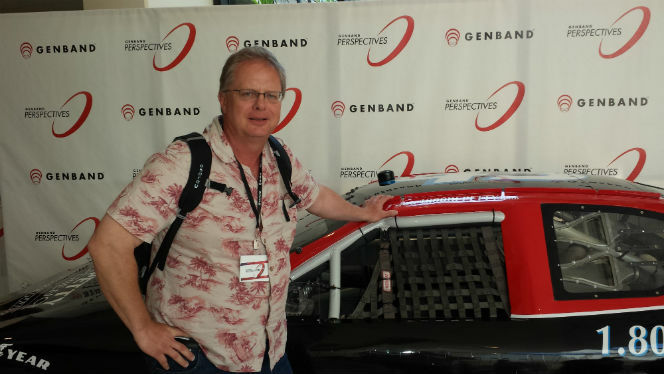 Genband have an application development toolkit, the APIs (eg for integrating your Google or Facebook contacts) that should make this a piece of cake keylime pie (we are in the southern USA). They also have mobile integration. You don’t have to be a Genband user to take advantage of the capability so every ITSP, ISP and web developer (even) should be interested. From a service provider perspective it gives you the opportunity to provide added value and sticky services. The beauty of the capability is that it can target communities of interest. Blogs could provide interactive opportunities for readers to discuss blog posts with others online at the same time. Visitors to online stores could IM chat about specific products – maybe ask questions of others who have already bought a product. Although it might be possible to implement purely web based services using Open Source this wouldn’t necessarily come with a toolkit of development resources and would probably lack the media resources that would make the customer experience a good one. It should be noted that whilst I’m being very bullish here about WebRTC it isn’t the finished article yet and has not yet been embraced by Microsoft or Apple. The former will be mulling over the fact that it just spent a fortune on Skype. We are yet to see any major developments emanating from that acquisition. Apple will be trying to defend Facetime. However with the number of Chrome users now apparently having overtaken the number of people using Internet Explorer and with Google being a major backer of WebRTC it can only be a matter of time before Microsoft adds it to their browser and I can’t see Apple staying out in the cold for ever. Anyway I have to go. It’s getting sticky here in Orlando. We must be due another thunderstorm. I’m off to the pool before it hits. trefor.net, Proudly powered by WordPress.